Hi! I am a stuffed llama from the soft and huggable Cuddlekins collection and I would like to come home with you. I am a helpful sort and rarely get cold as my soft and woolly snowy white fur keeps me cozy. Just like my live llama counterparts, I have cloven hooves with very nice gray toes. I'm not ready to carry anything, just now, as I am sitting down for a rest and reflection. Look deep into my warm brown eyes, and you may just want to rest with me. And did you know that when you give me, a loveable plush llama a new home, a portion of the proceeds helps to provide housing and education for disadvantaged children, as well as protection for abandoned animals throughout the world? Yes, Indeedy! Fun Facts about Llamas: While llamas are normally very willing to help you with your load, if you pile on too much, it may just refuse to budge. This fun Flopsies stuffed llama is sweet and cuddly with soft woolly fur, black hooves, and an understuffed, huggable body. This sweet plush llama has a huggable body of soft and wooly cream fur, brown hooves, and warm eyes. 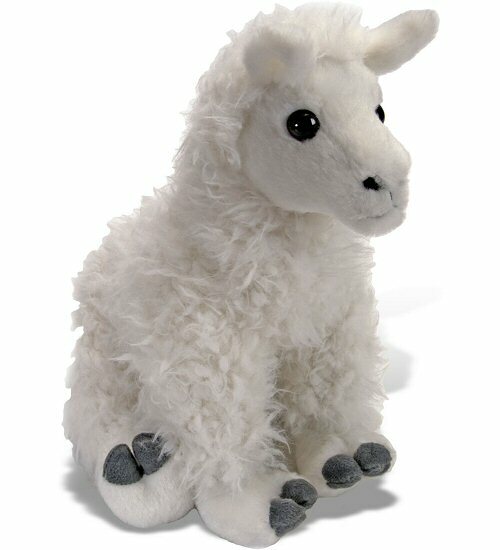 This sweet plush llama has soft scruffy white fur, corduroy hooves and inner ears, and ever-smiling face.